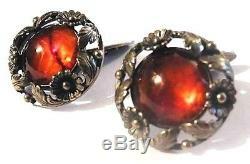 Denmark Sterling AMBER Cufflinks N. FROM Luminous Vintage Danish Classic ne. Don't you just love the warm, golden glow of Amber, the ancient stone of Scandinavia that they say holds the sun's light a very important quality in those northern climes! No wonder it has been so popular with their jewelry artists, from the Vikings to the Modernists. Dating from the 1960's, the heyday of Scandinavian mid century modern design, these elegant cufflinks, a classic design from the noted Danish firm N. And something about the combination of silver and amber adds to its luminosity, so they almost appear to catch fire, especially with movement in the play of light. 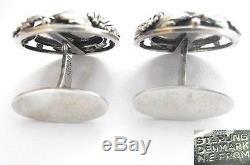 Please pardon the annoying reflections and glare in the photos; the cufflinks are. The amber domes are wreathed with flowers and leaves. The flowers are slightly concave with applied beads in the centers and scalloped edges. Incised lines, oxidation and open work also create interest and contrast and add to the sense of depth. Applied beading dots the frame, echoing that in the flowers and the central dome of the cufflinks. They are signed in all caps on one side of both findings, (penultimate photo) Sterling Denmark N.
From for Niels Erik From. The company closed in the 1990s and their work can only go up in price. From jewelry is among the finest made in Denmark during the 1960s - 70s. The jewelry exhibits fine craftsmanship with soft stylized floral and geometric designs, sometimes enhanced with semi-precious stones. Because of a significant volume exported to the U. His jewelry is easier to find at affordable prices in the collectible market, but these prices are expected to rise in the near future. " This is their quintessential (and early) "soft stylized floral design, beautifully enhanced with amber, and is so good looking, it is easy to see why it was so successful! The cufflinks are dimensional, measuring about 1" diameter by 1/4" deep and will light up your cuffs with their fiery glow. 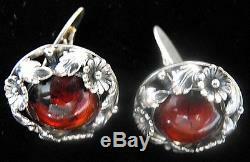 This pair of cufflinks is an exceptional example of From's work and is in Very Good vintage condition with just surface scratches, dirt and tarnish from normal wear, along with expected irregularities in the natural amber stones, including internal inclusions and debris that only add to the amber's mystique and its fantastic look. With the clean lines and cool design that characterize the best Scandinavian silver and a most effective combination of materials, these Danish sterling and amber cufflinks will add a captivating glow to your cuff! A classic design by one of the better known Scandinavian silversmiths, whose work is increasingly sought, these cufflinks belong equally in collections of Scandinavian silver, twentieth century modernist design, amber and cufflinks. They would make a terrific gift, although I doubt you will want to part with them, and will come to you in a gift box, just in case. 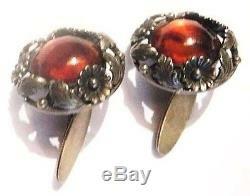 A striking pair of sterling and amber cufflinks by N E From to add to your collection of quality and distinction! 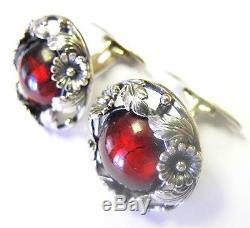 Please see our other listings for more great vintage jewelry, including cufflinks and Scandinavian silver. Both methods include gift box. International buyers aware of the rules and expenses of importing into their country are welcome. WE LOVE TO ANSWER QUESTIONS! If you have a complaint, please let us know. It is our highest ambition to deserve 5 Stars. We thank you for your custom! Powered by SixBit's eCommerce Solution. 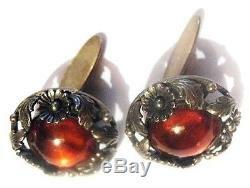 The item "Denmark Sterling AMBER Cufflinks N. FROM Luminous Vintage Danish Classic ne" is in sale since Thursday, October 13, 2016.